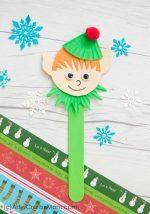 Gather your craft sticks to make this super easy and super adorable Popsicle Stick Gingerbread Man! 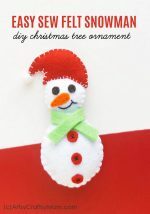 Perfect for hanging on your tree or as a cute bookmark! When you hear the word ‘Popsicle’, it immediately conjures up images of sunglasses, sun hats and yummy, dripping ice lollies. But these delicious and messy treats aren’t just for summer – they’re very much relevant during winter too! And we have proof – allow us to introduce you to our Popsicle stick Snowman and Popsicle stick Snowflake – classic winter icons, both of them! And today we have someone new to join the gang – a Popsicle stick Gingerbread man! 1. First we’ll get the body of the gingerbread man ready, by painting it brown. Let it dry completely. 2. 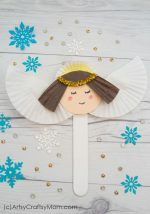 Cut a circle out of the brown card stock and a bow shape out of the red card. 3. Draw the details on the gingerbread man’s face. Use a white marker to create that squiggly pattern, a black pen for the smile and a pink crayon or color pencil for cheeks. 4. Stick on googly eyes to complete the face. If you like, you can use the lashed googly eyes for the gingerbread girl. Stick the bow under the face for the gingerbread man and on the head for the gingerbread girl. 5. 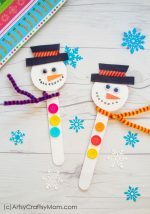 Stick the face on the Popsicle stick, add some buttons with the white marker and you’re set!! Don’t they make a pretty pair? You can make just the gingerbread man if you like, but I think he’d look rather lonely without the girl – and vice versa! 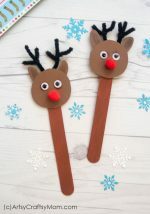 You can make these along with other Popsicle Stick Christmas crafts. These would look great hanging on the tree, on the mantle or stuffed into a stocking. 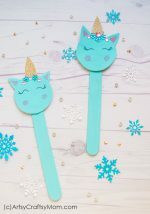 They also make cool bookmarks to give as gifts!